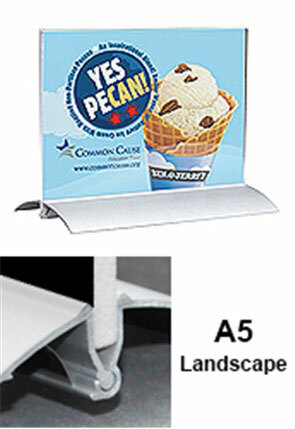 Free Standing Sign Holders have Metal Snap Bases! 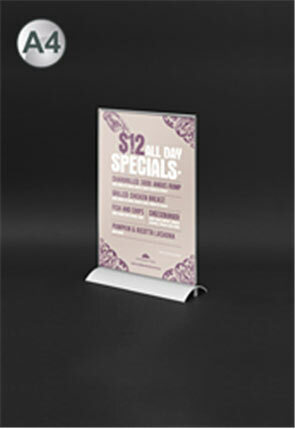 These free standing sign holders make showing your promotional signs around your business simple! The POS displays are offered in different sizes and styles in order to ensure you can find the right fit for use at your business. 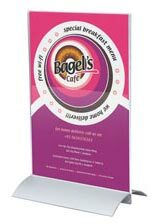 These retail stands, free standing sign holders are used in many different locations, including retail stores, hotels, casinos, restaurants, bars, jewelry shops, bakeries, cafes, take-aways, pubs, and more to show marketing signs in a stylish manner. These metal retail signs are ideally use on counter-tops, desks, and table-tops to show information to customers to help them make decisions or even offer insight into available services. With a wide selection of sizes to choose from, these double-sided signage holders make a great addition to any marketing teams arsenal. These double-sided display have a metal snap base, providing an upscale look that is just at home in high-end retail shops and jewelry stores as it is in pubs and information centres. 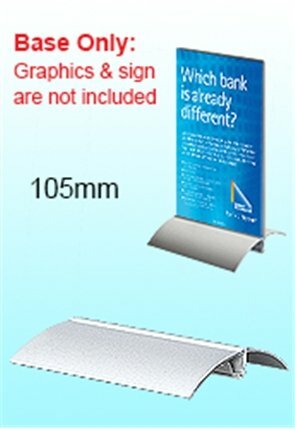 There are different sizes of graphics that may be used depending on which retail display you purchase, including standard sizes such as A4 (297 x 210mm) & A5 (210 x 148mm). 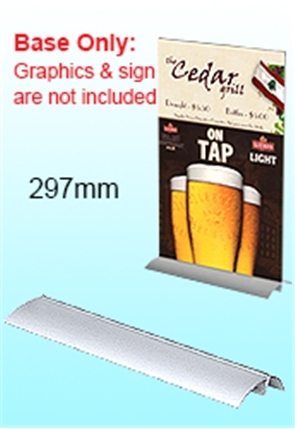 There are also different lengths that all you to place a variety of sizes of graphics within the metal snap base for display in your business. 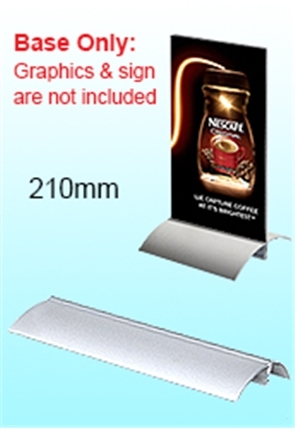 Many of the offered displays include an acrylic sign holder for placing your graphics in. By utilising clear plastic, your entire graphic is easy to see, and the frame helps to protect grime and dust from gathering on your posters whilst on display in order to maintain a professional look. Changing graphics out of these displays is an easy task as well, with no tools required to switch posters in less than 60 seconds due to the slide-in design! This makes these displays perfect for fast-paced retail environments where employee time is better focused on ensuring that customer needs are met. 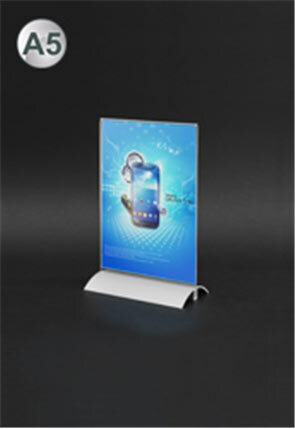 The aluminium base easily snap apart and back together to firmly hold the bent clear acrylic in place for display. 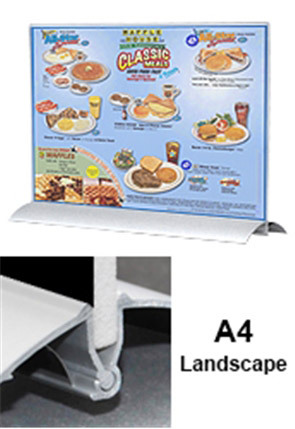 These retail signage stands have a spring-loaded base as well, assisting in changing out your graphics and making it easy for any employee to change out graphics with no tools necessary! 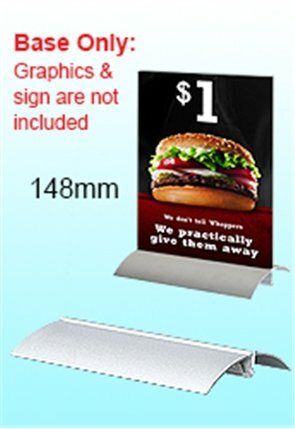 In addition to being used with an acrylic frame, these POS displays are also able to hold nearly any graphic that is up to 5mm thick within the base. Ideally, only rigid materials are used such as corflute to print your graphics on in order to prevent flopping of graphics whilst on display to make sure passersby may easily read the posters. 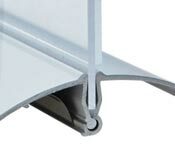 The extruded aluminium base provides a stable, durable display that can be use in heavily-trafficked areas for years to come. The satin silver finish is a classic look that is neutral to fit in with any décor without problem, a truly professional display. The retail stand is commonly used as a double-sided display, showing graphics to multiple people at once without taking up additional room on a desk, counter, or table to leave plenty of space for merchandise customer interactions, and more. Some businesses even put two different signs on each side to easily flip around without changing graphics depending on what time of day it is or how products have been affected! 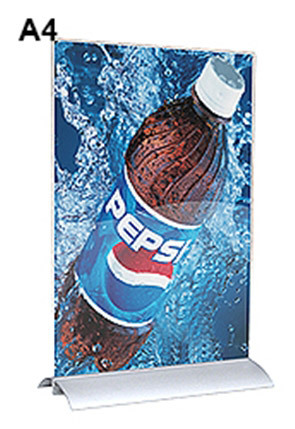 The lightweight displays are small to easily be stored when not in use, and with set-up taking less than 1 minute, these displays are perfect for hectic locations like retail stores and restaurants to be assembled at a moment's notice. 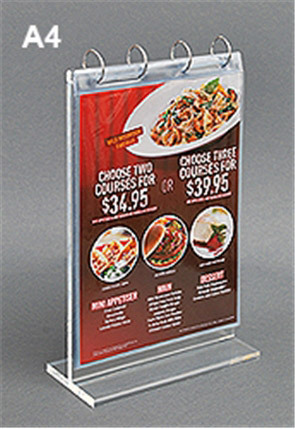 Many bars, pubs, and restaurants place their menus in these displays or show cocktail specials or event listing right on tables, as these displays take up little room and make it easy to provide important information to customers! 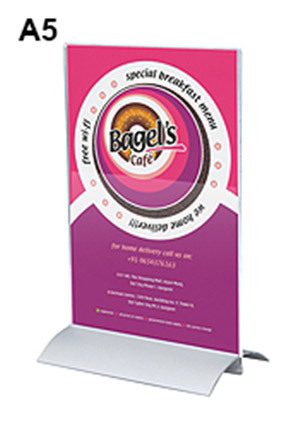 Order one of these quality stands today for use at your business. 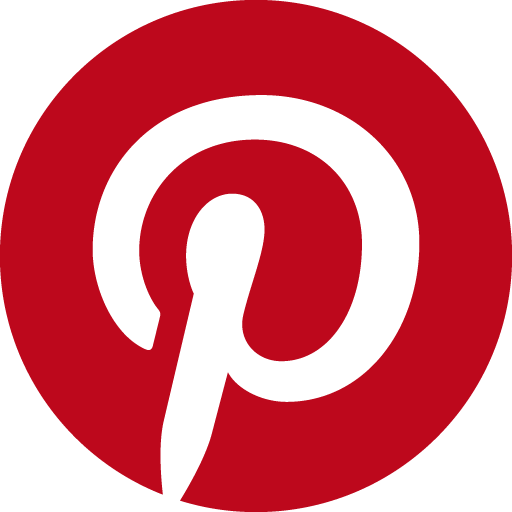 Retail signage includes heaps of different styles in variety of finishes for use within your business. 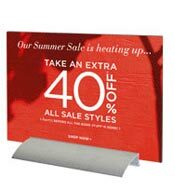 The wide array of products makes it easy to outfit your business in style, with effortless promotional displays that will easily gain the attention of passersby to show them pricing information, product specs, announce upcoming events, and more. Click here for access to the online catalogue, with hundreds of products in stock NOW for you to choose from for your business in many categories. We add new items for you to choose from weekly, helping to stay current with the latest trends, styles, & technologies to help stay ahead of the competition. Check out the photo frames, light boxes, cigarette bins, POS signs, clip frames, notice boards, iPad displays, pull up banners, hospitality displays, menu signs, sidewalk signs, custom corflute signs, and more to help your business market goods & services and promote merchandise! Slimline Warehouse has been a leading provider of goods to Australians for over 20 years. In this time we've made connections locally & around the world to offer our customers a great selection of products at low prices without compromising on quality. Each item is thoroughly inspected prior to being put on offer to ensure only long-lasting displays make their way to our customers. Our warehouse provides same day despatch with most in stock products to anywhere in Australia with purchases paid prior to 1pm EST. Order for your business today in Sydney, Melbourne, Adelaide, Hobart, Canberra, Bendigo, Perth, Brisbane, Cairns, Newcastle, Gold Coast, Darwin, Alice Springs, & Toowoomba!